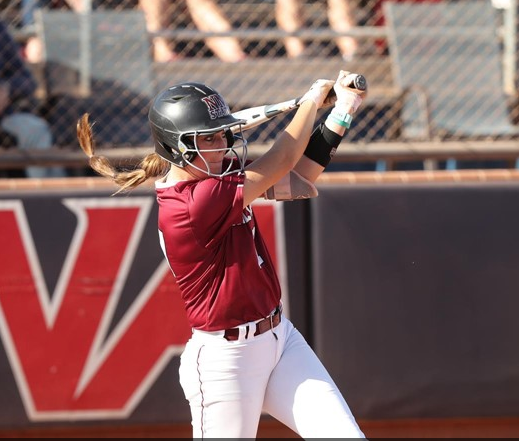 The New Mexico State softball team is getting ready to start a new campaign after winning the WAC tournament last season for the second year in a row. In 2018, winning the WAC tournament earned the Aggies a place in the NCAA Tempe regional tournament, where they lost their first two games against No. 8 Arizona State and Long Beach State to get eliminated. NMSU lost three players due to graduation last season: Rachel Rodriguez, Fahren Glackin and Amy Bergeson. All three were everyday starters with Rodriguez at shortstop, Glackin occupying first base and Bergeson in the outfield. Glackin and Rodriguez were each named to the All-WAC teams and Rodriguez also earned a place on the All-WAC tournament team. A notable returner is two-time WAC player of the year Kelsey Horton. Horton finished last season second in the nation in home runs (25) and home runs per game (.47). She was also in the top ten in the nation for slugging percentage (.911) and total bases (154). It is clear Horton is going to be the leader of the Aggies again this season. In her final season, Horton hopes to maintain everything she has earned over her illustrious career and set the next generation up for success. “I want to make sure that I withhold my reputation, make sure that I am helping out the younger ones because I am a big role model for them. Also, making sure that this season isn’t even about me — it’s about the younger ones and making sure that they grow and I help them build with everything that I can show them and do for them,” Horton said. Aside from their influence on the field, Horton says that off the field, Coach Rodolph and the rest of the coaching staff are the biggest supporters she could have asked for. “It’s pretty cool to have them understand that I work super hard off the field, like in the classroom, so they understand how to help me on the field. I think that it’s just our culture here, they stick with what they teach,” Horton said. New Mexico State was named the WAC preseason favorite after receiving five of the seven first-place votes, edging out Grand Canyon who received the other two. Along with being named favorites, the Aggies had four players receive preseason honors. Kelsey Horton was selected as WAC preseason player of the year and Kayla Green was selected as WAC preseason pitcher of the year. Along with those honors, Victoria Castro and Nikki Butler were named to the preseason All-WAC team. The Aggies are going to have two freshmen starting in the infield this season. Mya Felder is going to be taking over at third base, while Kayla Bowen will have command of the infield, starting at shortstop. “Both of them are definitely very talented offensive players as well as defensive,” Coach Rudolph said. Some other players that Coach Rodolph sees turning some heads this season are junior Brandy Hernandez, a local talent, coming from Oñate High School, and junior Caity Szczesny. Szczesny can do a little bit of everything as she has played some second base as well as had some time in the outfield during her Aggie career. From a pitching standpoint, the ace will be Kayla Green. The Aggies also have a deep bullpen as Coach Rodolph is anticipating some strong innings from junior Samaria Diaz, sophomore Analise De La Roca and freshman Chloe Rivas. “Kayla Green is going to lead us in poise and confidence and experience, but I also think Samaria, Analise and newcomer Chloe will all really be key in different matchups this spring,” Rudolph said. The Aggies open up their season this weekend as they host the New Mexico State Invitational at the New Mexico State Softball Complex. The ladies are looking to start this season’s campaign strong, but Coach Rodolph will be looking to sort out the strengths and weaknesses with this team during the first couple weeks of the season. One strength that Coach Rodolph sees early on is the depth with this year’s team. The road for their third consecutive WAC tournament title begins on Feb. 8 at 4 p.m. as the Aggies will go up against the Creighton Blue Jays. The Aggies will also conclude the weekend tournament with Creighton on Feb. 10. In between those games, the Aggies will be hosting interstate rivals the New Mexico Lobos and the UTEP Miners on Feb. 9.